The "Mpiandry ny Tompo", which could be translated as "Shepherds of the Lord", is a fundamentalist Protestant very specific in Madagascar. 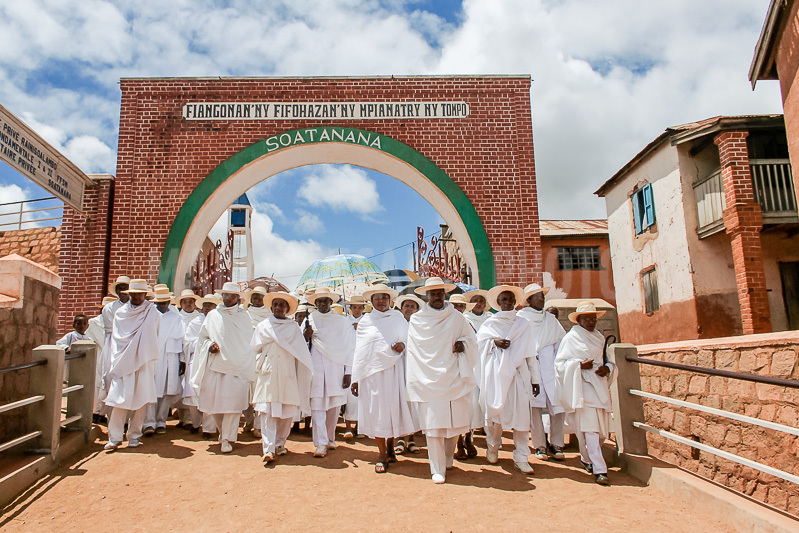 Isolated in the heart of the Malagasy Highlands, not far from Fianarantsoa in Betsileo country, the village of Soatanana is the historic center of the community. Their origin is not found in the teachings of foreign missionaries of the 19th century, but in the perception that the founders, many of whom had just left the cult of idols, had themselves Holy Scriptures. This village nestled in the middle of a mountainous circus was founded at the end of the 19th century by a named Rainisoalambo. All the inhabitants are dressed in white, with a straw hat with broad rims and a white ribbon for the men, for if the parents are "Shepherds", their families are "Zanaky ny Fifohazana" or "Children of the Revival" who rigorously follow the same precepts of life. Sunday processions are impressive, with this white tide breaking through the alleys of the village. Passengers are welcome and will be invited to share their meals after going through the ceremonial foot washing. Soatanana is not, however, closed to progress, since they have a private high school that accumulates good results in official examinations, their own taxi-bush, their dispensary and a system of care for the sick and elderly. The inhabitants of Soatanana live on rice, livestock and geranium and all the financial resources are centralized by the council of elders, which manages the funds for the good of all.